Many foreigners would agree with me if I said that Japanese cuisine is a very tasty and special one – definitely one that lots of people from several parts of Europe would be willing to pay a pretty penny (or yen) for – once in a while. When I tell my European friends that the sushi, miso soup, and soba are incredibly fresh and cheap here, they become jealous! Iʼm Italian, I love cooking, and I am very curious about different cuisines around the world. I try to learn some dishes when I visit a country for longer than a month. 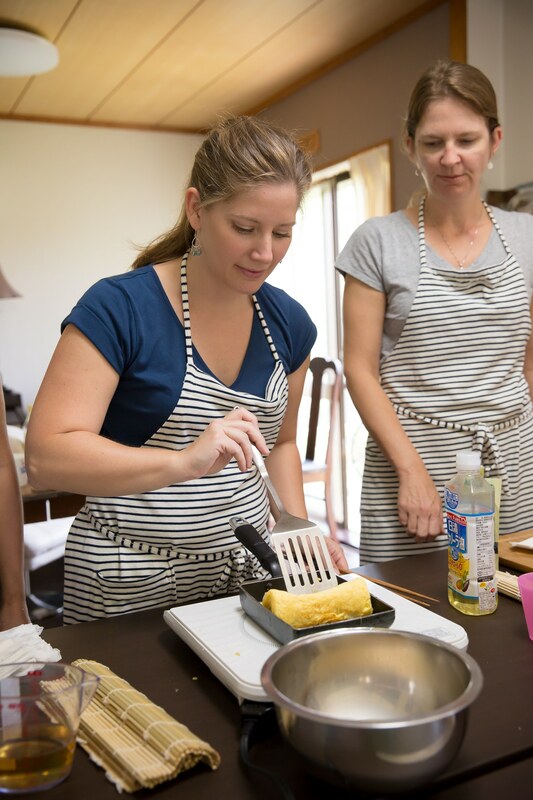 In a 5-day trip to Thailand, I managed to squeeze in a cooking lesson of three hours! I admit the opportunity was coming to take me by the hand and I just couldnʼt say no. Naoko turned out to be very friendly and, besides the “baby business” we obviously had in common (she has twins and I have a girl of about the same age), we talked about all sorts of things like we knew each other for years! I went to my lesson and was so excited. I didnʼt even expect the trip to the supermarket, which highlighted loads of products that I used to ignore (because I couldnʼt read what they were). Before we started she gave me a hand-out with names – also in kanji – of every ingredient so I could buy it on my own. Awesome! Not all cooking classes I took provided me with a clear hand-out. To me this is an important reference when cooking at home and trying the recipe on your own, because you don’t have time to take notes during the class. 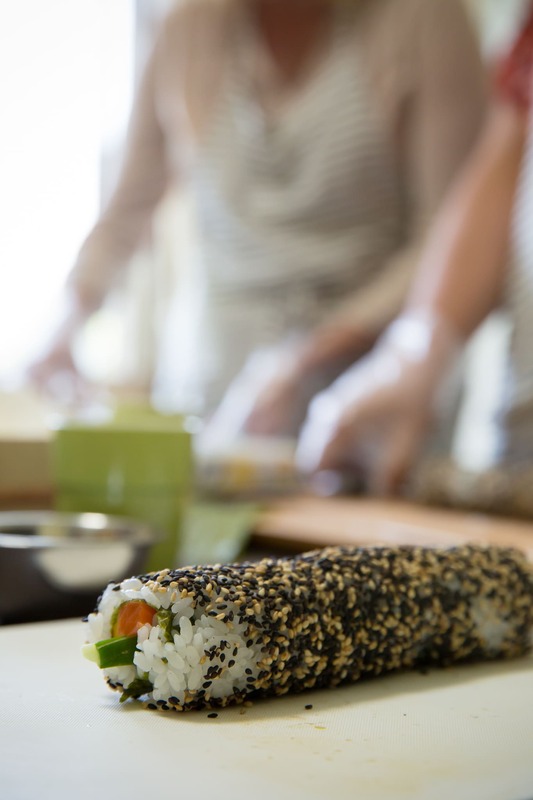 We made all the sushi types with veggies only because Iʼm vegetarian – and this is part of the reason why I wanted to make my own sushi at home. We used all the things I wanted to have in it: cucumber, avocado, egg, cheese, peppers, carrots, asparagus and sweet potato! I ate a lot of my sushi after the lesson … although it looked so pretty I didnʼt want to spoil it, and brought a lot of it at home for my husband. He signed up for a lesson together with some colleagues! 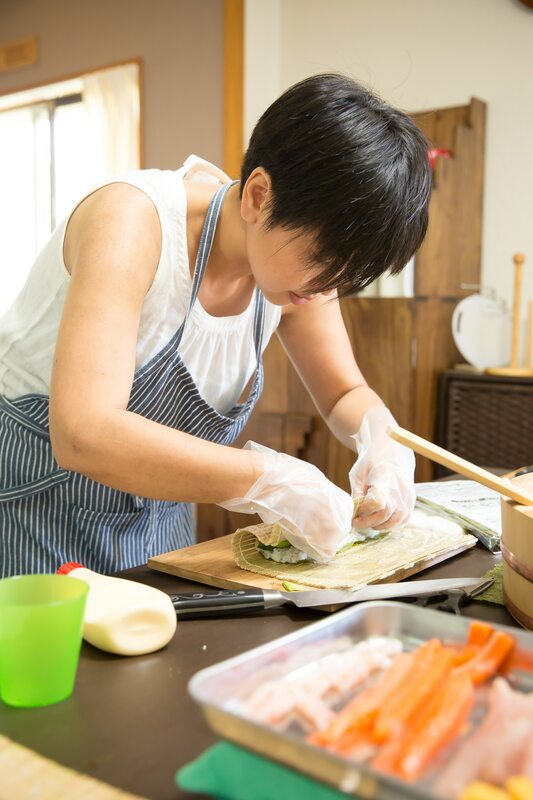 I really recommend Naokoʼs cooking classes because sheʼs also very passionate about Okinawan cuisine, and sushi is not the only dish she can teach you. Quite the opposite, thereʼs both mainland cuisine and Okinawan cuisine on the menu! Finally, this is a great way to “dive” into this incredible culture. In a cozy and familiar atmosphere, Naoko will make learning Japanese cuisine as easy as taking a walk. How to book a class: The schedule for group class is on her Facebook event section and also on the website. You can book a class on Facebook by sending a private message, or from the website. I think that the Facebook page is the most updated one and the quickest way to check class schedule. No classes are offered on Sundays. Pricing: It seems that fees are different depending on the class. For example, Yakisoba noodle class is 3,500 yen and sushi class is 5,000 yen per person, which is what I paid at that time. From Torii station, you go towards Zanpa direction. After Torii station, you will see San-A supermarket on your right. Second traffic light from San-A (one is just after San-A), you need to take a right turn. On the right corner, you will see a restaurant called Kuishinbo　くいしん坊. The building is one minute from there on the left where road is a bit curved.